Portobello Mushroom Pizza With Prosciutto! 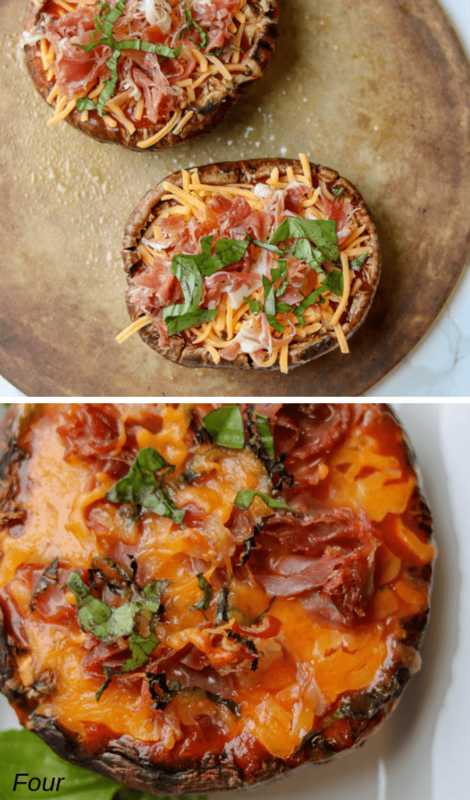 Easy and delicious mushroom pizza that’s keto proof, 30-minute proof, low carb, and made quickly with a few ingredients. 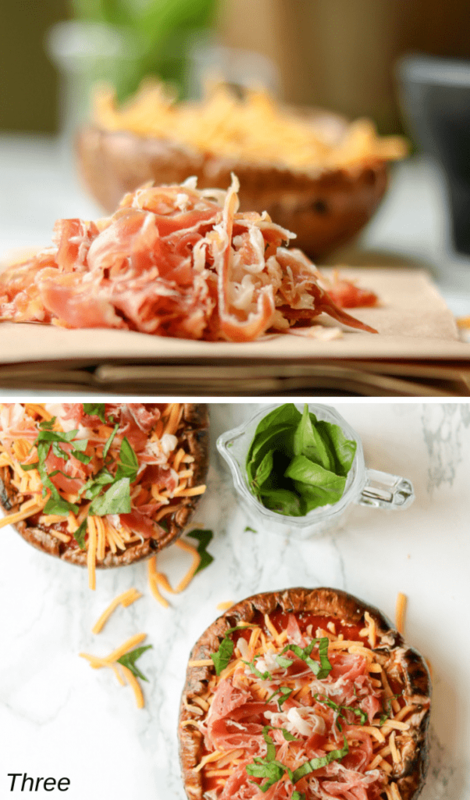 First, I brought you my Portobello Mushroom Burger recipe, and this week I’m bringing you Portobello Mushroom Pizza With Prosciutto! 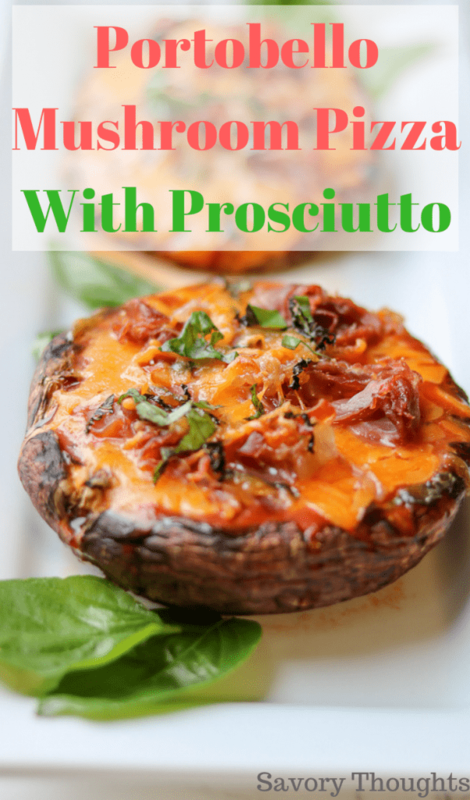 This Portobello mushroom pizza will make any meat lover go crazy! All ingredients used are from Aldi, with the exception of the fresh basil which is from my garden. Thanks to my friends at Aldi, I received a generous picnic cooler bag filled with delicious goodies from chocolate chip brioche bread, zucchini noodles, two different type of cheese, kefir, maple syrup which I often purchase, fresh watermelon, salad, and of course prosciutto which inspired me to make this Portobello mushroom pizza recipe. Here’s to another meal that’s perfect for Meatless Monday (if you remove the prosciutto). 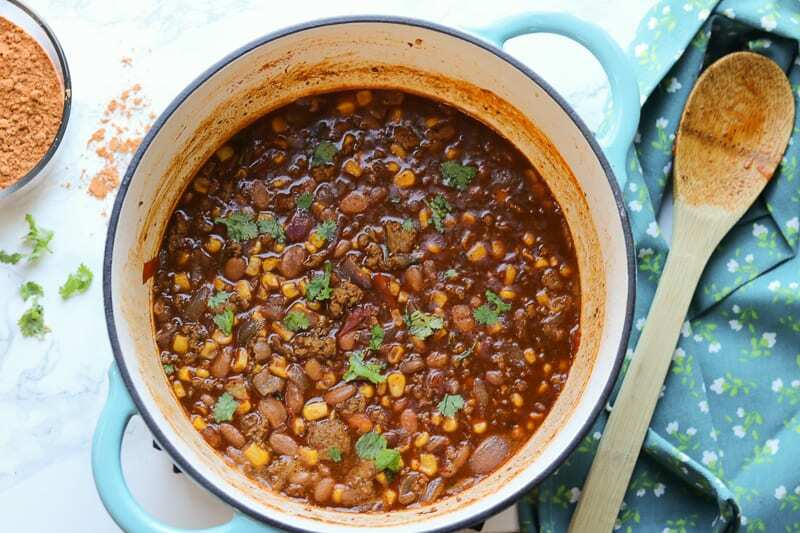 Great for Meatless Monday or quick weeknight meal. You can use any mushroom in pizza as they have meaty flavor after they have been cooked. However, the best mushroom to use when making mushroom pizza is the Portobello mushroom. 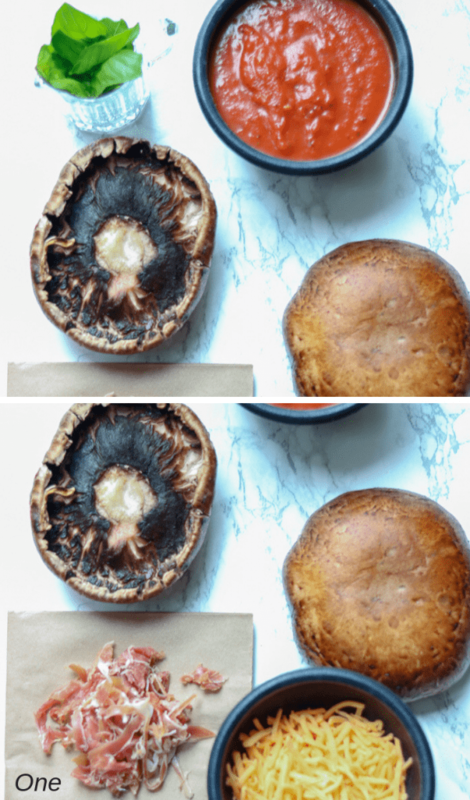 After removing the gills with a spoon and cutting the stem, I clean the Portobello mushroom cap with a wet paper towel and make sure to remove any dirt that was left over while packaging. This pizza is made with only 6 ingredients. Most of which are already in your pantry or refrigerator. You will need the following items listed below. 2 Portobello Mushroom, ½ lbs. cheddar cheese, 1 tbsp. fresh chopped basil, Marinara Sauce or you may use Aldi’s Primavera Pasta Sauce, olive oil spray, 2 slices chopped prosciutto. Clean and pat dry the mushroom. Chop the basil and set aside. 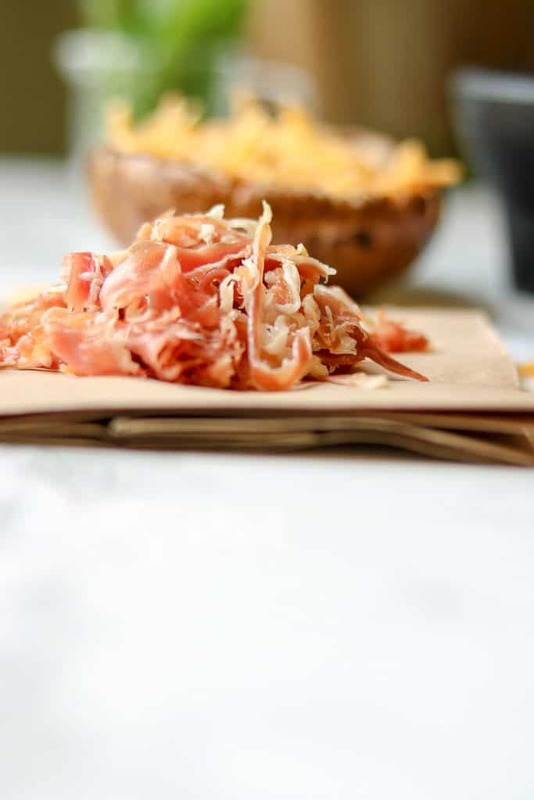 Cut the prosciutto slices, prepare the cheese and marinara sauce. Assemble your pizza: Fill the mushroom cavity with marinara sauce. Top with cheese, then the prosciutto slices and chopped basil. Bake for 20-25 minutes. Serve warm and enjoy! This is one of the easiest and most simple recipes you’ll make. 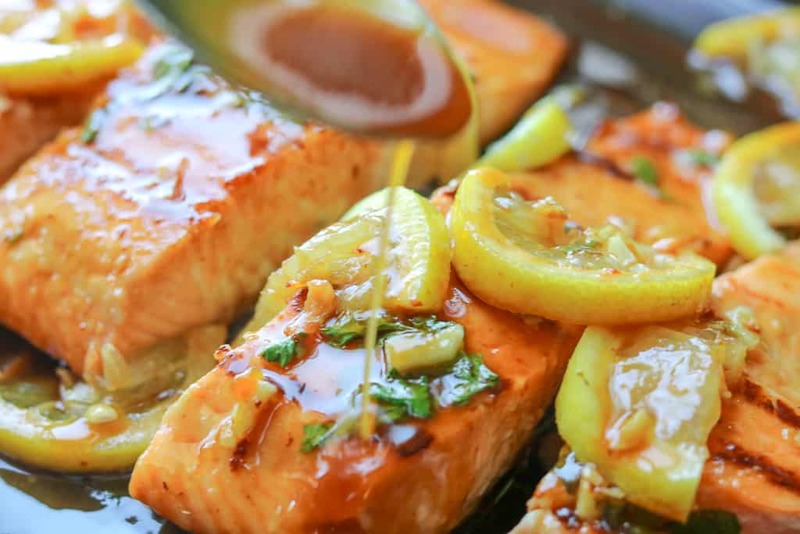 It is made with six ingredients and takes about five minutes to prep. Savory Thoughts: People who haven’t learned to accept and get along with themselves tend to have more difficulty accepting and getting along with others. Did you make this Portobello Mushroom Pizza recipe? Tag me on Instagram or Facebook and please give it a star rating below! 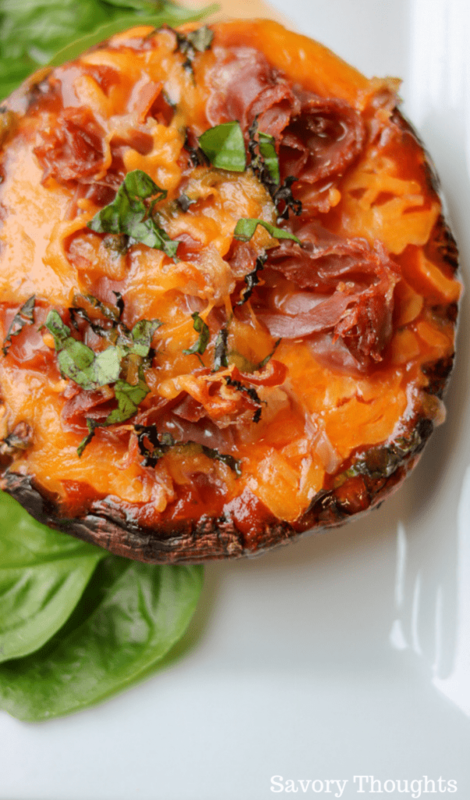 Portobello Mushroom Pizza With Prosciutto! 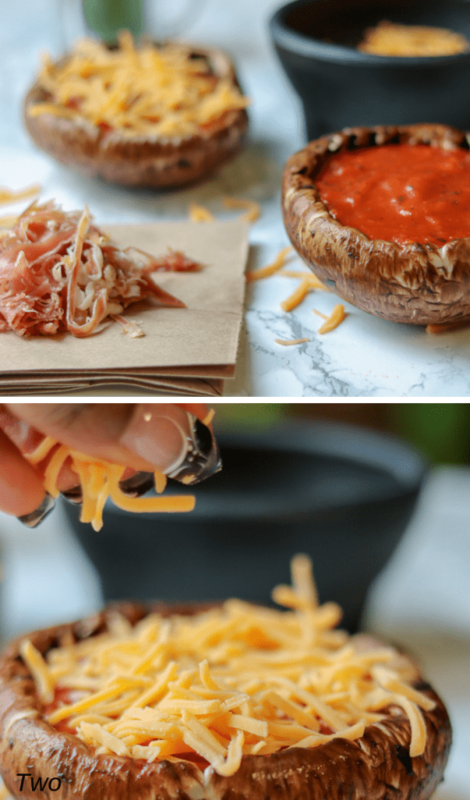 Easy and delicious mushroom pizza that's keto proof, 30-minute proof, low carb, and made quickly with a few ingredients. Clean and pat dry the mushrooms. Chop the basil and set aside. Cut the prosciutto slices, prepare the cheese and marinara sauce. 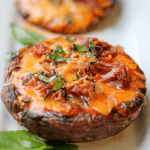 Assemble your Portobello Mushroom Pizza: Fill the mushroom cavity with marinara sauce. Top with cheese, then the prosciutto slices and chopped basil. Bake for 20-25 minutes. Serve warm and enjoy! If you rinse the mushroom under water, be sure to pat dry the mushroom completely before applying the sauce as it will run through the mushroom. You can create your own marinara sauce, or purchase Aldi’s Primavera Pasta Sauce. I love stuffing mushrooms they are great all ear round and even work really well on a BBQ, not stuffed them with pizza flavours before though, fab idea. I love this idea! Such a fun keto way to get yummy pizza flavours. 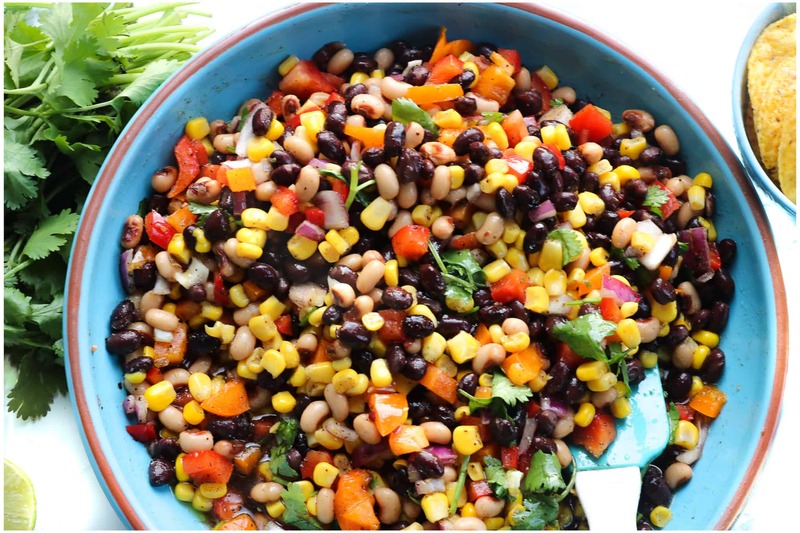 I love this idea for an easy healthy weekday meal! Love this. Your mushroom pizzas look so delicious. Such a great idea! Def want to give this recipe a go! This is actually genius! And best of all I have almost everything on hand and will pop this on this weeks menu plan – thank you!